Seems to be quite a bit of info in the CR archives. They were a relatively high-profile manufacturer back in their day. Have seen plenty of racers in their kit in older photos. For only 250 euro, why not? Helyett was taken over by Gitane somewhere in the 60ies. Gitane kept offering Helyett-branded bikes during most of the 70ies, these were regular Gitanes with Helyett stickers, often with the Gitane-logo engraved in the fork crown. The red one in the pic could be a Nation in disguise, with a handbuilt all-Reynolds db frame (from around 1978). Rides like a French dream! Were they still bolting on pump brackets that late? People still do it today! Helyett closed in 1962. The name is interesting. It is taken from the lead character of a late 19th century play, Miss Helyett. That is why the head emblem shows a young woman's face who is wearing a bonnet. The play is about a young English woman but was written and performed in France. Had one come through. It was a darkish grey-green coulour with black lugs and Simplex ends. Head emblem was foil type affixed with adhesive. Sponsored a pro team in the day. Surprised no one has mentioned the most well known rider of Helyett. 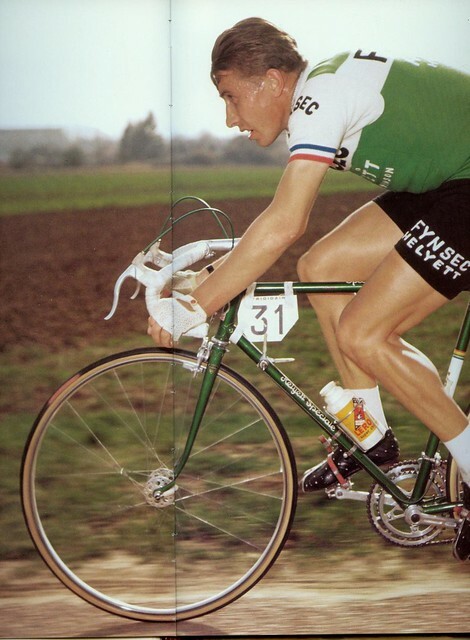 Jacques Anquetil. Hilary Stone has a Helyett Special 56 cm frame from the 1950's for sale - price is 195 pounds and it is original paint in good condition. Only issue of sorts is that the derailleur hanger was cut off for some reason but barring having a piece re brazed at least one can still attach a derailleur with a bolt on hanger. must be a uk export model with lighting fittings on right side. interesting to see that headplate is affixed with fasteners, the one i had was done with adhesive. the young lady on the head emblem is actress Biana Duhamel who starred in the original production of the "Miss Helyett" operetta ca. 1891. 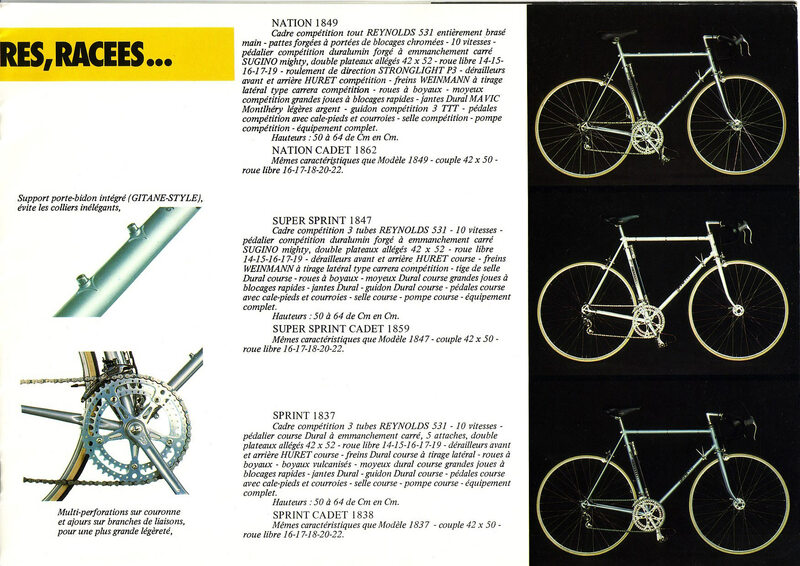 And if you read post 25 from Iab's original link, you will find that Bernard Carré built the top end bikes used by Anquetil while riding for Helyett. I consider any post by Norris Lockley on the CR list as a must read for French cycle history and lore. Looks pretty good. Post Gitane takeover, but I don't know enough about them. Maybe a bit more research and a sleep on it. Norris identifies lady's face on head emblem as that of Marianne, the French national symbol. Some readers may recall that actress Catherine Deneuve served as Marianne for a number of years. He states that company maintained two factories, divesting of one in 1962 and continuing to operate the other until 1966. If correct, this would presumably be the date of the acquisition of the name by the gypsy girl from Nantes. States that first factory was employed to manufacture Griffon cycles following its sale. Says that the aluminum sheet head emblem affixed with adhesive was the final type. Had previously read elsewhere that 1962 was the date of the company's closing. Beat me to it. 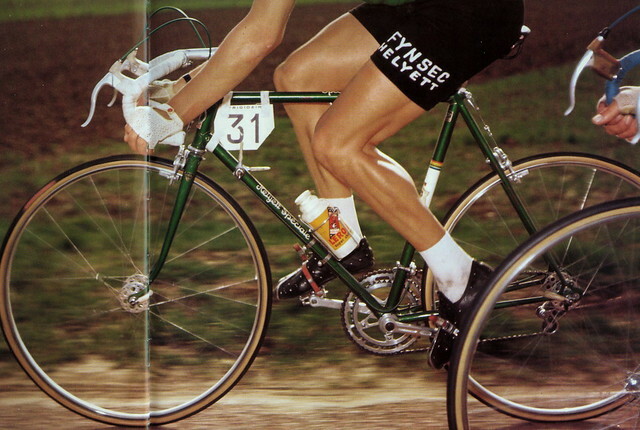 BTW, that's a great shot of Maitre Jacques' distinctive toes-down pedaling style. big thanks to our favourite aircraft carrier. The quality of this photo is IMO outstanding. Vibrant colors, perfectly focused on the subject matter. doth the LERO name on his boutaille d'eau refer to the nutritional products company or something else? I too think the red bike imaged is from the later 70's, the basic ensemble of components and the short horizontal dropouts. The pump bracket is pretty minor. 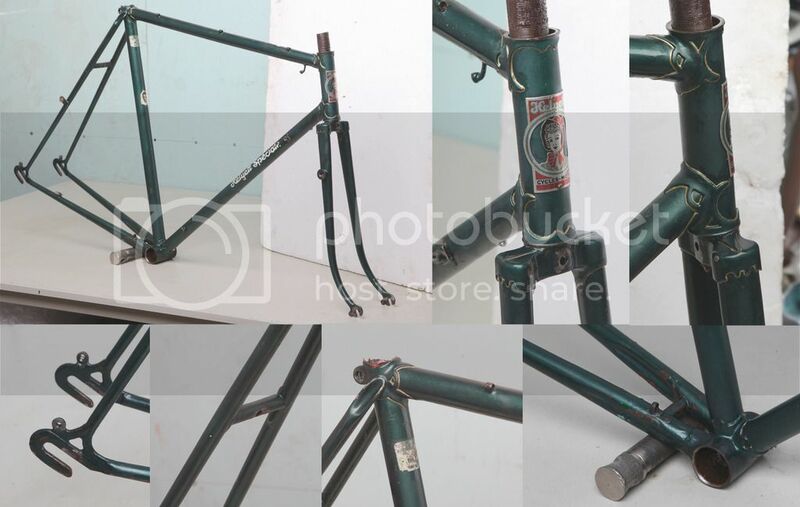 Most were using frame fit then true, but the French brands did not make as many sizes as say Silca did.